The Bath Spa Band members opened the ceremony with a short overture. Welcome and Introduction, by Jim Warren. The theme of Jim's introduction was the need to remember those who died as real people who didn't go to war; the war came to them. They had lives, hopes and dreams for the future, but their future was cut short by the Bath blitz. To succeeding generations, these real people can only be known by the stories told by others. That is the reason why the memorial naming them is important. It is a permanent reminder that there are stories to be told - lest we forget. We exchange a greeting and we pass upon our way. With our wartime friends we part - for so it has to be. But their names are written in the book of memory. Memories of a Survivor, by John Follon. 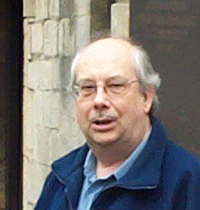 John told how he and his family took shelter in the cellar of their house at 24 Kingsmead Terrace when they heard the first bomb to shake the house. That bomb fell on a chip shop in Kingsmead Street. They stayed in the cellar during the first raid, and were choked with dust when their chimney stack fell through the house damaging it badly. After the raid ended they went to the local public shelter for the rest of the night. In the morning, they found their house badly damaged, the house next door, Number 25 completely flattened, and no trace of Number 26. He told how one person was rescued alive from under Number 25, but most of the Cutting family who lived there were killed. He described his family's attempts to rescue a few belongings from the wreck of their house, and their travels around a series of temporary lodgings until they were rehoused. Laying the Wreath, by Zach Cutting. Zach laid the wreath in memory of his Great Grandfather, John Thomas Cutting and his Great Grandmother, Amelia Caroline Cutting. 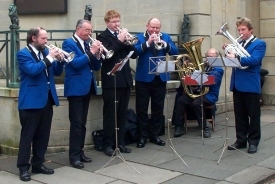 The Musical Tribute, by members of the Bath Spa Band. These bandsmen brought the ceremony to an end by playing three short pieces: "Crimond", "Eventide" and "Ellers". Two of these are better known as the tunes to which The Lord's my shepherd and Abide with me are sung. Many thanks to Studio Flowers of Charles Street for their kind donation. 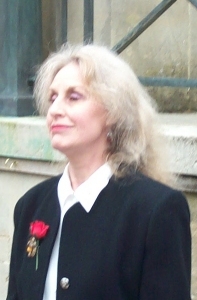 Click here for information about the plans for the 2007 ceremony. 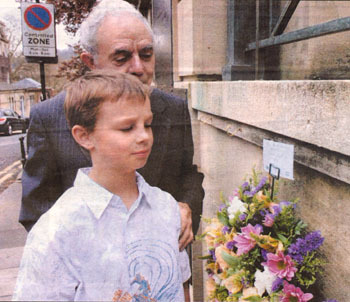 THE moments when the city was torn apart by bombs have been described by a survivor of the Bath Blitz at a ceremony to remember the victims. 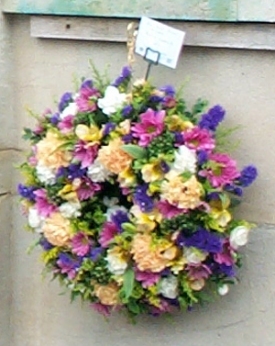 This is the fourth year a wreath-laying ceremony has been organised by the Bath Blitz Memorial Project to remember the 417 residents and visitors to the city killed during two terrible nights on Saturday April 25, and Sunday April 26, 1942. John Follon was eight years old when bombs destroyed his home and much of the rest of Kingsmead Terrace. 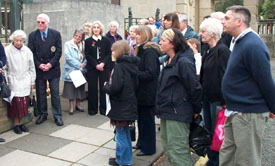 He was among those who gathered for the wreath-laying at the memorial dedicated to victims of the blitz at the city's cenotaph. 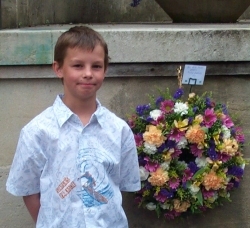 The wreath was laid by ten-year-old Zach Cutting, from Peasedown St John, in memory of his great-grandfather John Cutting, who was among those killed. Mr Follon, now 72, had lived just a few doors away from Mr Cutting. He had heard the first bombs fall on the Saturday night and rushed for shelter into the cellar with his mother. His father had been out watching for fires in James Street West at the time. When the young Mr Follon emerged, he was greeted with scenes of chaos. "We were choking on dust," he said. "We went to get to a proper air raid shelter." This decision saved his life as the house was later destroyed by bombs. "When we came out we were in the city centre and it was chaos. There were people crying. There were people who were left with nothing, just the clothes they were standing up in. The emergency services did a good job and the Salvation Army was helping people. We were taken to Cold Ashton and we slept in a disused chicken shed but it was better than sleeping outside. During that time more bombs fell. It was very, very traumatic." 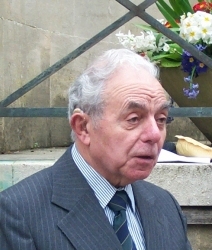 Mr Follon, who now lives in Swainswick, said he was pleased there was a lasting memorial to the blitz victims. Before the wreath-laying, a poem was read by Kathryn Barrett, a prayer was led by Edgar Evans and the Bath Spa Band played The Lord Is My Shepherd and Abide With Me.